We moved closer to the Equator last weekend, landing in Brasilia, 7° north of the Tropic of Capricorn. Ted had some business at the University of Brasilia. His colleagues, our friends, Adson and Diana, showed us around several of the campuses spread far and wide throughout the city. Brasil is going through political and monetary tough times. Unsurprisingly, the turmoil was evident throughout the city, particularly on campus. 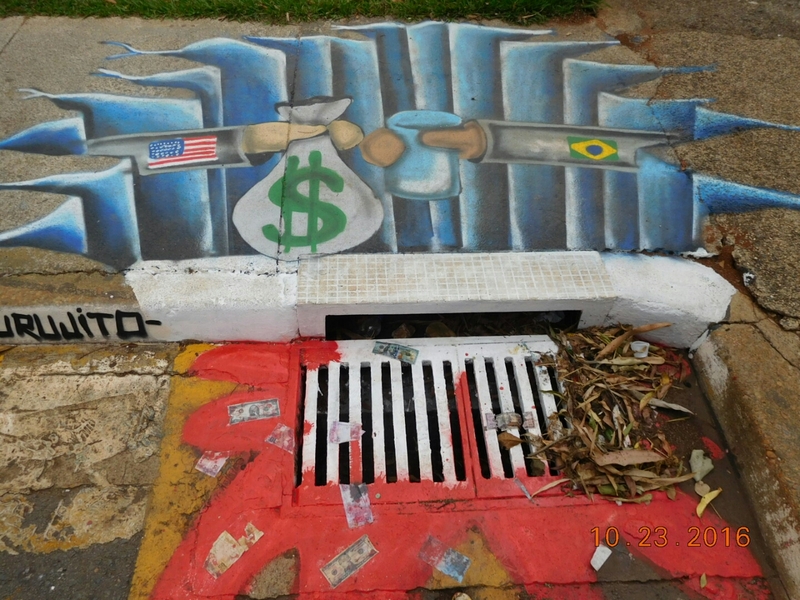 This red, white and blue sidewalk painting shows the arm of the USA offering a bag of money to Brasil who in turn offers a barrel of oil. These images overlay the great waterfalls of Brasil which turns to blood red as it flows into a sewer drain. Copies of dollars and Brasilian raeyes are glued to surface, pouring with the blood into the drain. The truth of this matter lies between the Left and Right extremes portrayed in the painting. I was startled when I saw this graffiti. In my book, this painting is good, honest art, nothing less. Salud to the artist.